When you drive in Thailand, the rules change, and some of them are quite curious. Here is a collection of driving and traffic tidbits. Q: How many people fit on a small scooter in Thailand? A: 3 or 4 is not uncommon, but I have seen 5. Only two are legal, by the way, but nobody cares about that. Q: What kind of helmet is the most popular in Thailand? A: The one that prevents you from getting a fine. This is mostly a super cheap proforma helmet which costs about $3.- or 4.- God forbid you need it to protect yourself in an accident. 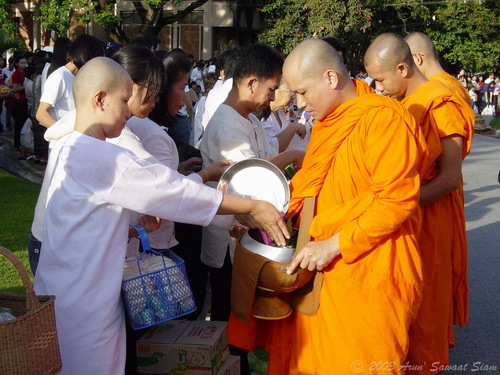 There is an annual vegetarian festival in Thailand. The timing is based on the Chinese calendar, and this year it was held in late October. 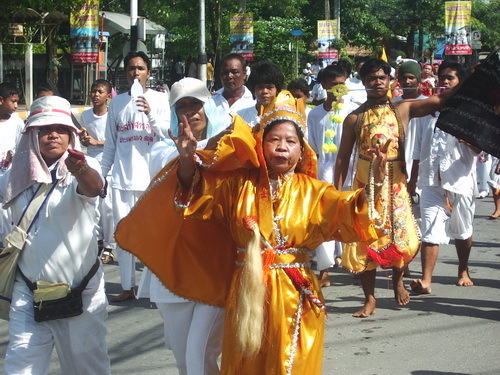 It is a ten day event which is loosely observed all over Thailand. In most places it just means that some food vendors switch to selling vegetarian dishes. However in some areas in the south of Thailand events take a bizarre turn. The origin of this festival stems from 1825 when a traveling Chinese opera company fell seriously ill and managed to cure itself by eating a vegetarian diet and performing rituals and ceremonies. This impressed the Chinese community in Thailand so much that they decided to establish a yearly vegetarian festival to celebrate and promote this self-healing method. Is Traffic in Thailand Chaotic? Many first time visitors to Thailand are complaining about the chaotic traffic and tell me they would not dare to drive here. Yet I have been driving in Thailand for many years and I do not see any chaos. Why is that? The answer lies in your expectations. In the west traffic rules are strictly enforced, fines are very expensive, and people mostly follow the rules. Therefore when they drive, they expect others to follow the rules. Anyone breaking the rules makes people upset. Continue reading…Is Traffic in Thailand Chaotic? When you travel to Thailand or visit any other country, it is easy to assume that our values apply there also, or that other people think like we do. This can lead to very embarrassing situations when we find out that we just unknowingly insulted someone or made a fool of ourselves. Before your Thailand travel adventure, familiarize yourself with the following two lists. One is about things that you should never do, and the other is about things that you should do frequently. I promise you, your Thailand holiday will go a lot smoother and be more fun. Thais love food! It is everywhere. No matter where you are in Thailand, you are almost always within walking distance of food. In many western countries you have to drive for miles to find something edible, but here it is everywhere. Restaurants, food vendors with carts on wheels, mini restaurants set up on motorbikes with sidecars, food markets, food stalls, floating food vendors, grocery stores, supermarkets… You can always find something to eat regardless of the time of day or night. Food in Thailand is so important that a common way of greeting someone is “did you eat already?” You see people eat in public at all times and in all places. Eating is not considered a private affair. Who Says that Money Does Not Grow on Trees? As you can see, here is a genuine ‘money tree’, actually several of them. They grow up rather quickly in many places in Thailand. Now I have to admit that the growth of the tree has less to do with fertile soil than with the generosity of the Thai people. 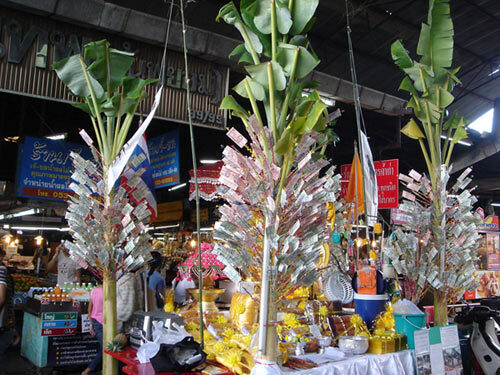 ‘Money trees’ are set up in a public place, like here in a fruit and vegetable market. People then place money on the tree until it grows into a very expensive tree. The purpose of this is to support a temple project such as a new construction or a renovation project or another pious cause. Continue reading…Who Says that Money Does Not Grow on Trees? What Kind of Touching is Allowed in Thailand? Once I was traveling in Mexico, and I met a girl from Spain. Like me, she was backpacking around the country and we spent a few days hiking and sightseeing together. Then we both continued on our separate ways. When we said our good byes, she kissed me on the cheeks, and I hugged her. Both of us were a little surprised and uncomfortable. In those days I did not know that kissing on the cheeks is a normal way of greeting in several European countries. And she did not know that hugging is quite a normal exchange among friends in the US. However in the US we do not kiss on the cheeks when we greet someone and in Spain people don’t hug casual friends. So I was a little surprised by her kiss and she was surprised by my hug. Now I live in Thailand, and touching is an interesting subject here. Girls often walk around hand in hand, and men sometimes put their arm around the shoulder of an another man in a casual way. In social gatherings Thais often have body contact, but only in a casual way. 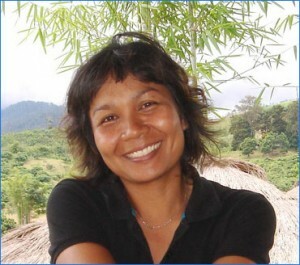 Continue reading…What Kind of Touching is Allowed in Thailand?